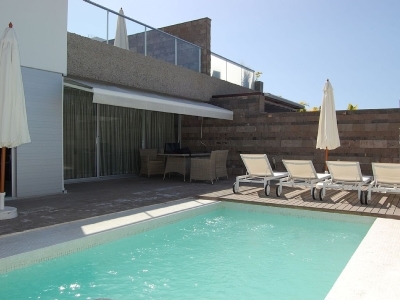 Villa Lily is a modern villa with four bedrooms and three bathrooms in the Del Duque area of Tenerife. The villa is in a very good location as it is a small walking distance from local amenities such as restaurants, bars and shops, as well as the beach and sea front. The villa is very well equipped with air conditioning, as well as wifi internet access and satellite TV including English channels. The kitchen has all the appliances that you would expect from a modern villa, including a dishwasher, washing machine, oven, fridge/freezer etc. The villa is laid out over 3 levels. The master bedroom is on the 1st floor with it's own ensuite bathroom, and access to a private terrace. There are 2 further bedrooms on the ground floor and 1 bedroom in the basement. All of the bedrooms have extra large double beds. There are 3 bathrooms, including the ensuite. Outside there is a private heated pool, sun terrace, covered terrace with sun awning and patio table and chairs as well as a balcony upstairs. A deposit is required to secure the booking and the balance of the booking is payable directly to the owner on arrival.